Today we are seeing an unprecedented mass of one-day strikes of fast food workers around the country, with events in well over a hundred cities. Fast food is a $200 billion dollar a year industry in this country, providing a large mass of low-pay jobs as well as being tied to many of the health crises we are seeing from early onset diabetes to childhood obesity and heart disease. Workers have organized with the support of unions like the Service Employees International Union with the Fast Food Forward campaign and the Fight for Fifteen, an effort to push a new $15/hour minimum wage as a living wage. This campaign saw recent incredible success at the SeaTac airport in Washington, as well as the surrounding town, where the cross-board minimum wage for all workers will now be $15/hour. Today workers are demanding the same wage along with the “right to unionize without retaliation,” which should already be guaranteed by the National Labor Relations Board regulations. Right now half of fast food workers are on some form of government assistance, from welfare to SNAP, programs funded by taxpayer dollars. At the same time, according to a recent report from the Institute for Policy Studies, fast food CEOs have taken away $183 million dollars in the last two-years of tax deductible “performance pay” through a loophole in the tax code. This lowers their annual tax bill by about $63 million dollars, meaning they are not even paying into the government that their low-wages are forcing their workers to rely on for basic assistance. This does not even include the massive government handouts that companies like KFC, McDonald’s, Pizza Hut, and Taco Bell have received, which puts their own lobbying efforts against “government handouts” to the poor in question. There is an obvious crisis of class inequality in the U.S., which, while always being present, has taken huge steps upward in recent years. After the economic crash of 2008, and the subsequent housing crash of 2010, we have seen an atom bomb go off in the job pool of all sectors. As some degree of recovery began entering the fray, the new jobs that were added were often temporary, high-risk, and low-wage. Fast food led this growth and is one of the largest regions of underpaid workers, creating a growing issue for working people to reach the most basic living needs. We are seeing the increase of full, and even double time, workers who still cannot afford basic needs such as adequate housing. This is creating a new class of working poor, often called the “working homeless,” a group of people who remain homeless despite working steady jobs. The campaign has seen major coverage, as well as incredibly supportive portrayals in major news sources like CNN, The New York Times, and the Boston Globe. For those of us who see movements as intertwining it can become obvious why these fast food strikes pose an important turn in the class fight-back. In the housing justice world many people have focused almost entirely on banking fraud and the issues around foreclosure without tying it together with the general issues of working-class victimization. The fast food strikes pose an important strategic point for all movements that make up the struggles against austerity and economic access, and there are a few key reasons why today’s events mark an important stage for housing organizers as well. One of the key elements here is that housing access is afforded to people only through their available means. We have often heard the term “food desert” to discuss inner city neighborhoods that do not have immediate access to healthy food sources, but the term “job desert” could be easily applied. In areas with a long history of economic strife and poverty related crime, the ability to find employment outside of the fast food sector can be next to impossible. In one of the most expensive cities in the world, fast food workers in New York City make an average of $11,000 a year. This is only about 25% of what they actually need to survive in this area. This would be impossible to live on in even the cheapest cities, but here it is a death sentence. For those who are looking at access to housing as an endgame, even when housing is protected from the banks and affordable housing pools made available, workers making these types of wages are making access to regular housing impossible even under the best circumstances. In comparison, the average daily pay for a fast food CEO is $25,000 a day. It is in this stark comparison we see that it is all basic needs are being undercut for fast food workers, making even the discussion about adequate housing irrelevant for those that can afford next to nothing. The struggle to make housing affordable and available is the struggle to eliminate class barriers to it. On the one side we struggle to take housing out of the marketplace and a good controlled democratically by the people, but on the other end we still live in an economy ruled by capital and if wages are too low to afford anything we cannot meet in the middle just by focusing on the housing sector independently. Instead, this is a multi-front fight that needs to be engaged in a number of sectors simultaneously, and the ability for low-wage workers like fast food employees to see a living wage opens up their access to housing almost immediately. This empowers us in the housing justice movement since it means that workers who are now seeing moderate housing financially accessible can begin finding stable communities, and we can then fight to keep rents and mortgages within financial reach and to protect people who lose their jobs or are still finding it difficult to make ends meet. Additionally, this is a project of workers self-organizing in their workplace in their own economic interest. As people begin to see the power of organizing in their own interest, this expands out into the community and often keeps them engaged for life. If we see these fast food strikes successful, possibly ending in rank and file unionization, we will see engagement in other projects rise as they see how much power they truly have. This can echo out into our neighborhoods, allowing our housing organizations to grow and to see greater labor support. Likewise, if our solidarity is seen in their workplace struggles you can guarantee that labor will see an investment in our housing projects as worthwhile. 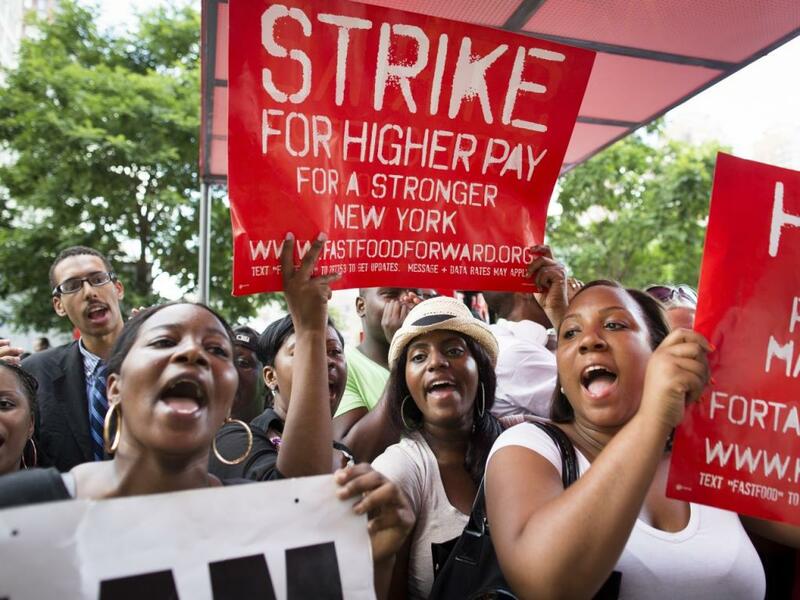 At the same time, these fast food strikes mark a more radical turn in organizing in general. Instead of simply lobbying for a higher minimum wage(though this is still happening), the fight has been taken direct to the workplace in one day “open shop” organizing that is a huge change for big labor. As unionization continues to slide downward in the U.S., we are finally starting to see a change in labor tactics as the type of organizing usually associated with the Industrial Workers of the World are actually being employed here by unions like SEIU. We should continue to keep in mind that this is not an entirely autonomous groundswell just from the workers, but it still marks an incredibly positive turn in the type of organizing large business unions are willing to take and invest in. This change has also marked their increasing support for community struggles, especially in housing. Many SEIU locals have begun funding housing projects or are supporting active housing justice projects, even though results and intentions have been questionable at times. In Portland, Oregon, the We Are Oregon project has targeted foreclosure and evictions and were tasked with helping to develop the independent Housing Is For Everyone(HIFE) project, which they use resources and staff time to help start before pulling out with the hope that it will continue to work autonomously. This strategy has had hits and misses, but what it shows is a willingness for labor to move outside its comfort zone and to see workers struggles as being tied to housing and other issues. The bureaucracies are still in place, and we should continue to remain critical of them, but this positive turn should be encouraged as it is going to begin directing resources to housing justice movements more generally. Additionally, this is usually the communities that have the greatest need for housing as it is. This especially true for housing liberation projects where homeless or underhoused families are supported in opening up empty, bank-owned homes. It is easy to end up in a subcultural niche when doing housing organizing, especially when housing liberation takes on squatting or communal characteristics. Here is a way of directly connecting with the affected community, which should be the primary focus of any of these organizing efforts. Continue to connect with people who also have an active need for democratic and open housing access, and participation here can be a great invitation to these affected populations engaging in the housing justice movement out of direct need. What these strikes really remind us is that the housing justice movement is not centered on the issue of housing on its own, though things like rampant fraud and discrimination are rampant on their own. Instead, this is a fundamental issue of class struggle that roots itself in the unequal distribution of resources and economic power. Fast food stands as a beacon of an exploited workforce, where people are underpaid and does not allow people to engage equally in the things we all need. If we are really to target the unequal distribution of housing in this country, then it is always going to come down to the fundamental inequalities inherent in capitalism. To really confront this we need movements that take direct action in multiple sectors, where workplace struggles are one of the most important ways to target the sources of this oppression right at the point of production. Labor struggles are an indispensible part of the economic project we need to target if we are to ever get close to our dreams of equal access to housing and community control over the sector as a whole. This means less that we need to walk away from our housing projects to begin organizing fast food, but instead to find ways of intertwining these efforts and having long-term mutual aid between movements. Coming out to support striking actions, as well as any labor struggle, is going to be critical for a groundswell against the fundamental economic inequality that is starting to break down the working class and eliminate chances for survival. The economic condition of the dominant classes is a puzzle made up of pieces from a range of sectors, but its fundamental frame is simply about the distribution of finances. If any movement here is to be successful it will be because of the connections between them and the working relationship that sees them with a common end. Right now the fast food strikes show a member-led organizing campaign that is finally tackling a sector that labor has had difficulty with for years, and so we need to stand in immediate support to ensure that this point of struggle will see major advances. Along with the Our Wal-Mart campaign, this stands as one of the most important labor struggles in recent memory and its success will have a direct result on access to housing for millions of Americans and the strength of our movements as a whole. We cannot keep these movements completely segregated from each other, and if we are going to target housing issues from their systemic root then we are going to have to keep it centered on issues of class. If we are going to create a groundswell of support for these economic campaigns then we will also need to utilize any movement that has the attention of the public to discuss these issues. This is simply one of these, and we can use this context to discuss the plight of low-wage workers across all industries and the effect that the lack of adequate pay has on sectors like housing, healthcare, and rates of things like drug addiction. We need to unite in a common struggle if we are going to be successful in any of our individual movement, finding a common task in the struggle for economic stability. Looking back at this old post, what sorta retrospective would you do?